Sabine Devielhe – Mirages: Beautiful! Yes, I’m a fan. She has such a beautiful voice, no idea what angels sound like, but you’d hope they have a similar sound. I love her 2016 Mozart album (see my initial review here, my comment on the same album winning the Gramophone award in that category, and that I named this among my top 5 classical albums of 2016). Note that her Rameau album with Alexis Kossenko Le Grand Théatre de l’Amour is also outstanding. I was also very close to put this into my Top 5 Classical Albums of 2017, I simply didn’t because I simply felt more comfortable writing about repertoire that I’m more familiar with. Consider this a late addition. I must admit I’m really not a great expert on French music. I like the occasional Rameau, my understanding of Berlioz is pretty much limited to the Symphonie Fantastique, I know a handful of works by Franck, only dabble a bit in Debussy and Ravel, and that’s it. Half of the names on this album I had barely heard of (Charles Koechlin, Ambroise Thomas), some were fully new to me (Maurice Delage, André Messager), and I’m also only very superficially familiar with the works of Delibes and Massenet, the two big names of French opera (after the obvious Bizet). So keep this in mind when I write a “review” that it is hard to objectively judge something that you literally hear for the first time and have no reference in mind. As mentioned, this is a rather unfamiliar repertoire for me. We start with André Messager, who has an impressive track record managing opera houses (Opéra Comique, Covent Garden, Opéra de Paris), but also did quite a bit of composing. This starts with an aria from his opera Madame Chrysanthème. from 1893. A beautiful melody if there ever was one. And then you get the angelic (sorry for falling into clichés…) voice of Devielhe, and you get immediate bliss. Next is an extract from Claude Debussy´s Pelleas et Melisandre, one of the two works of the entire album I actually knew. Unfortunately, very short, beautiful nevertheless. 4 consecutive tracks are devoted to Maurice Delage´s Poémes hindous. What? Exactly, no idea. Wikipedia tells me these (composed in 1912) are Delage´s most recorded work. I´ve been collecting classical music for 20+ years now, and I had never heard of the guy. Doesn’t matter, this is beautiful and an excellent discovery! Another great revelation for me were a number of songs recorded with the great Alexandre Thauraud on piano, from Debussy, Stravinsky, Berlioz, and Koechlin. Overall, in spite of Devielhe’s outstanding vocal capabilities, this album never turns into impressive self-serving vocal gymnastics, but is a a beautiful window into the French vocal repertoire. Note to self: I should probably find a replacement adjective for beautiful here, as it pops up wait to often in this review. Well, if you look up “beautiful” in http://www.thesaurus.com you’ll find, among others, dazzling, delightful, elegant, angelic, bewitching, and radiant. I couldn’t have summarized this album better. P.S. By the way, on this album I haven’t read a single negative review, it gets highest praise from all my typical sources (Gramophone, Classica, etc.). This will be my last post for 2017, hopefully you’ll stick around and we’ll meet again in 2018! Author MusicophilePosted on December 30, 2017 January 3, 2018 Categories *****, Ambroise Thomas, André Messager, Charls Koechlin, Claude Debussy, Igor Stravinsky, Jules Massenet, Léo Delibes, Lieder, Maurice Delage, Music, OperaTags Album Review, Alexandre Tharaud, Erato, Mirages, Sabine Devieilhe8 Comments on Sabine Devielhe – Mirages: Beautiful! Let me first of all do a quick detour here: You won’t find a lot of 20th century classical music on my blog. It is very simple, the further we go away from tonality, the less I like it. So the territory of the impressionism of a Ravel or Debussy are still borderline, some Prokofiev is as well, but I rarely really enjoy Shostakovich, and don’t even get me started on true twelve-tone and other stuff. I just don’t get it. As I know some smart people who really adore Schönberg, Webern, Boulez et al. I’ve often wondered why I have this barrier. You see, the visual arts took a similar turn from concrete motives to abstract concepts, and I actually like a 1950 Picasso usually significantly more to a Turner, or any 18th century art. I really appreciate Jason Pollock and Sam Francis (especially the latter). So here I am much more open-minded (OK, when it gets to Duchamp’s Fountain or most of Joseph Boys, I’m out, but at least I get (or believe so) intellectually what they are trying to get at). But atonal music (and sorry, while some will say there is no atonal music, I think most readers here will get the concept). is something I just don’t get. Probably my brain is to small or too hard-wired in the well-tempered scale to go there. Back to the early 20th century, and more specifically Debussy. Why write about this right now? Well, I think I’ve mentioned before the excellent Swiss radio show “Diskothek Im 2“, that gets two experts in the studio and compares 5 different version of a given classical work, and this fully blindly. A very interesting exercise which I should do even more often at home (you’ll be surprised how much your most beloved conducted can disappoint when you don’t know it’s him, or vice versa). So, a recent show compared 5 recordings of Debussy’s Image. These 6 little poems, with beautiful names like Reflets dans l’eau (reflections on the water), or Poissons d’or (goldfish) are probably among the best known examples of what we call today impressionism, similar to the earlier period in the visual arts (Debussy apparently didn’t like the term by the way). The editor chose 5 contemporary recordings, and so the classical reference version of these, by the amazing Arturo Benedetti Michelangeli on DG in 1971 was out. By the way, I’m just re-listening to this version right now and it is outstanding, so don’t hesitate to get it in spite of its age. And here I must admit, while I had heard his name before, I didn’t have a single Bavouzet recording in my collection. Something to be corrected ASAP, as while I don’t always agree with the invited experts, in this case, recording number 4 clearly stood out (in spite of no recording of the 5 being a negative outlier, all had their qualities). I suppose it’s the mixture between extreme precision and the ability to just get sucked into the music. Have you ever sat in the small west-end Musée Marmottan in Paris? It doesn’t draw the gazillions of visitors that the Musée d’Orsay gets, but it actually has an exceptional Monet collection. There are two main reasons to got there. A, there is an entire corner where you sit surrounded by Monet’s water lilies. Believe me, they are better than the original in Giverny. And there is one, rather little painting, depicting a rising sun over foggy harbor waters, with some small boats passing by, called Impression, Soleil Levant. And yes, this is what gave Impressionism its name. Sorry for the detour, but watching this particular painting, and listening to Et la lune descend sur le temple qui fut played by Bavouzet gives about the same feeling, that is somewhere out of this world. 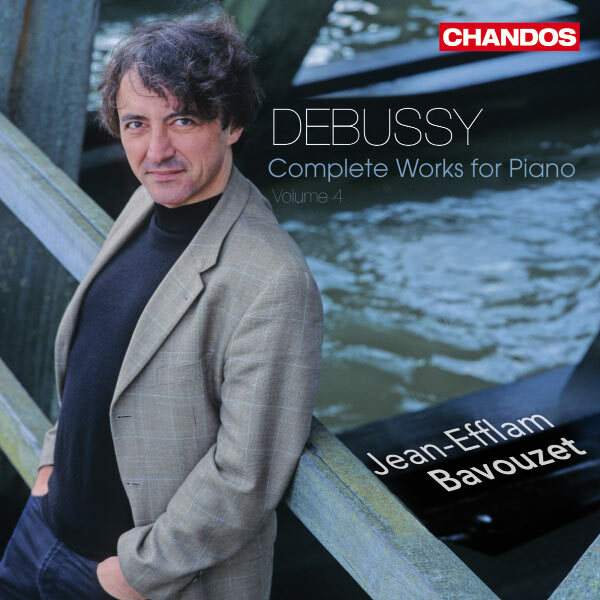 This is actually album number 4 of Bavouzet recording Debussy’s complete works, I assume all other volumes are equally worth having, but I didn’t yet have time to check them out. You can get it here directly from the label.